Supreme Court nominee Neil Gorsuch has a new problem beyond having been nominated by a president who’s under FBI investigation, or the Democrats lining up to filibuster him. Politico has determined that Gorsuch published a book in 2006 which plagiarizes other sources in “nearly verbatim” fashion without bothering to give any credit or citation to the original sources. This revelation comes at the worst time possible for Gorsuch, who is already facing a tough fight that threatens to tear the Senate apart. For instance John McCain ripped into the “stupid idiot” Republican Senators of his own party today, after Majority Leader Mitch McConnell threatened to permanently eliminate the Supreme Court confirmation filibuster just to get Gorsuch on the bench (link). But that may not matter at this point, if the plagiarism charges against Gorsuch have sufficient negative impact on his prospects. 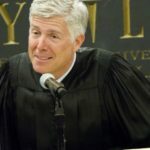 Two university professors have told Politico that they believe Neil Gorsuch’s lifting of passages and failure to cite sources in his book meets the strict definition of plagiarism, while some other plagiarism experts are chalking it up more to “sloppiness” on his part. But Supreme Court justices are supposed to be bastions of integrity held to a higher standard than anyone else applying to any other job, so this revelation has the potential to create explosive problems for Gorsuch in the coming days – if not hours.